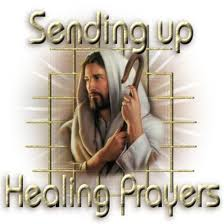 Father, in the name of your son, I pray to you concerning Danielle’s healing. As I do this, I believe and say that your Word will not return void, but will accomplish what it says it will. I believe in the name of the Messiah that Danielle is being healed as I speak the Word of God. It is written in your Word that your son Himself took our infirmity and bore our sicknesses. Therefore, with great boldness and confidence I say on the authority of the written Word of God that Danielle will be redeemed from the curse of this sickness. Satan, I speak to you in the name of Yeshua and say that your principalities, powers, your spirits of present darkness and your spiritual wickedness in heavenly places are bound from operating against Danielle in any way. She is the property of the Messiah. She is a child of God and gives Satan no place to dwell in me. Have Danielle to dwell in the secret place of the highest God. That she abides, remaining stable and fixed under the shadow of the Almighty. His power is in her and no foe can withstand Him. Now Father, because I and Danielle reverence and worship you, I have the assurance of your Word that the angel of the Lord encamps around about her and delivers her from every evil work. No evil shall befall Danielle. No plague or calamity shall come near her dwelling. Have the Word of God abide in Danielle and deliver her perfect soundness of mind and wholeness in body and spirit from the deepest parts of Danielle’s nature in her immortal spirit, even to her joints and marrow of her bones. The Word of God is medication and life to her flesh for the law of the Spirit of Life operates in her and makes her free from the law death. Have her put on the whole armor of God. Have the shield of faith protect her from all the fiery darts of the wicked one. The Savior is my High Priest and He is hearing my confession and I hold fast to this confession of faith through the Word of God. I stand immovable and fixed in full assurance that Danielle will have health and healing in the name of the Lord Yeshua and that her healing was purchased through the blood of the Savior and that as I pray these healing scriptures, His anointing power is being released into Danielle’s life. It is attacking her sickness or disease in her body and she will be healed. Please share this so that we may have intercession from all four corners of the World, thank you for your support. Thank you so much for sharing this fantastic webpage.